Vivien Johnson (with the book) in front of a Papunya Tjupi painting when the exhibition tour began at the University of NSW's Art & Design Gallery. It's impossible to see it on the ground. You need to be in the air over Papunya to discover that, rather than being laid out like some white 'burb in the middle of nowhere, this legendary dumping place for desert Aborigines has actually been shaped as the mythic Honey Ant Dreaming pattern of four sets of concentric circles touching. This imposition over the assimilation prison camp plan, devised by the last vestiges of terra nullius in Canberra in the 1950s, seems to have happened as inexplicably as an English crop circle. But it's a wonderful example how the people we wanted to make as white as us reasserted their culture and society against all the odds. Of course, the 'invention' of Aboriginal art in Papunya in 1971 was another such assertion. But, just as it now seems possible that one of the main well-springs for bringing the 'art' of ceremony in from the deserts to the townships where tribal people were being 'brought in' to live actually happened earlier, up the road in Yuendumu, where a Men's Museum incorporated paintings on its walls, so the legend of Papunya that was assiduously developed by Geoffrey Bardon, the teacher who first encouraged the painting of a mural in ceremonial style on the walls of his school ceased to actually relate to Papunya after about 1981. But it had become a brand, so needed to keep the word Papunya in its Papunya Tula Artists name even after its Pintupi artist members all left for their Country way out west around Kintore and Kiwirrkura. All this is the background to Vivien Johnson's meticulously researched book, 'Streets of Papunya', whose underlying purpose has nothing to do with town planning but much to do with her subtitle: 'The Reinvention of Papunya Painting'. The irony here is that Johnson has been the most assiduous chronicler of Papunya Tula in such tomes as 'Once Upon a Time in Papunya' and the quasi-biblical, 'Lives of the Papunya Tula Artists'. Now she's mounting a different horse, back in the township that time forgot, making the case for the artists left behind at 'Papunya end' where it took forty-something years to get them any sort of art centre, even then requiring Johnson's and the Uni of NSW's College of Fine Arts backing for them to carry on the practice that their forebears had pioneered. She makes the case that they'd taken it forward more successfully than the departing Pintupi with the likes of Clifford Possum, Michael Nelson Jagamarra, Johnny Warangkula and the first generation of women artists achieving style variations and setting price records while the Pintupi men, exemplified by an artist like Turkey Tolson, who was “condemned to paint 'Straightening Spears' (his canvases covered by parallel lines) for the rest of his days”. 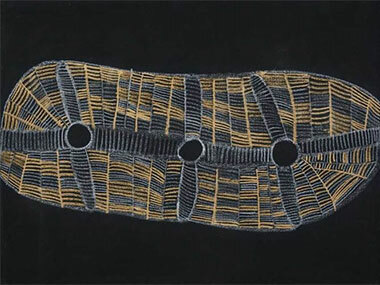 And this pioneering was recognised by the more astute Western art curators; Nick Waterlow put Papunya end art in his 1979 Sydney Biennale and Bernice Murphy in her 1981 Perspecta show, doing much to encourage the reluctant institutions of Australia to start buying Aboriginal art at last. But the Kintore mob's style limitation might seem to raise questions about the excessive influence of art centre directors/coordinators over their artists. Johnson points out that anthropologist Eric Michaels did this as early as 1988 in his infamous essay, 'Bad Aboriginal Art', suggesting that there was an “imposed authenticity of styling in Papunya Tula art”, especially its “autumn tonings”. But then she ripostes with the pungent Billy Stockman quote from Bardon's writings: “Don't you tell me how to do Aboriginal art”; and in Yuendumu, they made their own decision to move from opposing the idea of “Giving away all your Dreaming to white people” to inventing their own colourful way of doing it. Issues of key importance to the Indigenous art movement like that appear through the book – which goes back well before the events of 1971 to Albert Namatjira's exile to Papunya for 'grog running', his return to painting there just before his death, and his son Keith's staying on, teaching Kaapa and inspiring Possum to start carving and getting involved in the production of more than 500 bilingual school books with Hermannsburg-style illustrations. Johnson concludes that the Namatjira legacy lay in showing that “an artist was something to be”. She's also an inveterate genealogist, both of families and their tribal roots. The book basically leads up to a 4-page family tree of Papunya descent. This matters to Johnson to support the argument that Aboriginal families are much more efficient at passing on the painting to their offspring than white artists. This, she acknowledges, has something to do with art's income-earning potential. But much more important, Johnson argues, is the ownership of story passed on through the art, which was done at home in the early days rather than in the isolation of an arts centre. She also spots the deliberate inter-tribal marrying off of daughters and the links maintained between the Kintore mob and Papunya end through marriage. This allowed women to inherit a wider range of Country to paint - though they tended to resist the men's “making dangerous way” (being too revealing) in their art. Tribal confusion does result, though, from Johnson's odd use of Jumu and Luritja names. She believes Jumu – a name I'd never heard of before - was the dominant tribe when Papunya was established as an inter-tribal dumping ground. In fact, Norman Tindale's magisterial 'Aboriginal Tribes of Australia' believes that the tribe had been largely wiped out by an epidemic in the 1930s, passing remnant children on to the Kukatja. Thought – why do we care so much about animal and plant exterminations, and so little about those of Indigenous peoples? The Kukatja then disappear from Johnson's record, becoming Luritja. Once again Tindale begs to differ, insisting that Luritja was an insulting term for Kukatja invented by the Aranda and much disliked by the Kukatja! One might also argue that Johnson's coverage of the decade-long efforts of the Warumpi Art Centre in Papunya to fill the gap left by PTA with a shop in Alice Springs but no art building in Papunya is reluctantly tackled in the book. She even declares that it “closed without explanation” - then, later, offers several pages of reasons why it didn't work: incompetence, rivalry, amateurism, lack of Council support and the pressures of 'back-yarding', with carpet-baggers easily able to tap on to the artists in a day trip from Alice Springs. But there is no reference to Russell Skelton’s book analysing Papunya's administration at this time, 'King Brown Country', described as “a powerful and shaming portrait of a community in crisis. Papunya remains an emblem for the failure of all Australians to come to terms with the continent’s oldest inhabitants.” In 2011, King Brown Country won both the Walkley Award for Best Nonfiction Book and the George Munster Award for Independent Journalism. So Vivien Johnson really wants to tell the positive story of the emergence of the Papunya Tjupi art centre from the legacy of Warumpi and PTA and over the reluctance of organisations like Desart and Canberra's Department of the Arts to add to art centre numbers despite the enthusiasm of the artists, encouraged by the original PTA man, Long Jack Phillipus and Michael Nelson, and their ancestry. She does it from first-hand experience and in detail from October 2005 to the opening of “the best art centre in the Desert” in 2009 – running through funding, buildings gained and lost, art coordinators gained and lost, and artists transformed by the opportunity to work together, old with the young, lead from formulaic work into finding their own voices via their inherited stories. The notion that criticism of work by fellow Aborigines is a no-no is dispelled, with regular group critical sessions held and the 7+ year role of Isobel Major Nampitjinpa (Billy Stockman's granddaughter) and her husband Patrick as art workers in the centre including the task of transmitting the views of the market back to the artists. Doris Bush Nungarrayi discovers the courage to reveal her youthful sexuality on canvas, Tilau Nangala “finally conveys the strength she has as a person” through painting and Beyula Puntungka reveals her abstract appreciation of the “rhythmic organic forms” of the Honey Grevillea flower in ways that remind Johnson of Margaret Preston. There are rare insights in this book into the minds of individual Aboriginal artists as well as a detailed appreciation of the Central Desert painting movement, based as it was upon a combination of “the elements of geography (the Dreaming sites depicted), history (events that occurred in the ancestral past) and ceremony (ritual re-enactment of those events), seamlessly fused into one visual image”. 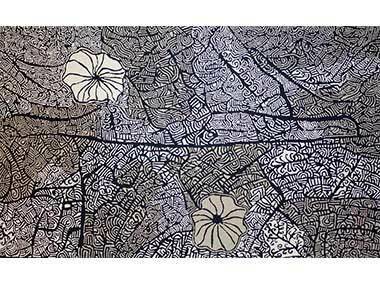 An exhibition of the same name as the book, Streets of Papunya is touring, opening on Thursday 15 July at the refurbished Drill Hall Gallery in Canberra. I note, too a show called 'Papa Tjukurrpa', new works by Doris Bush Nungarrayi at RAFT South in Hobart running until 30th of this month. 'Streets of Papunya' is by Prof Vivien Johnson and published by New South Books $50. Doris Bush's 'Papa Tjukurrpa - Nyumannu', Pastel and fixative on canvas, and on show at Raft South, in Hobart. Beyula Puntungka's 'Kalinykalinypa Tjukurrpa' (Honey Grevillea Dreaming) 2014 with hints of Margaret Preston.